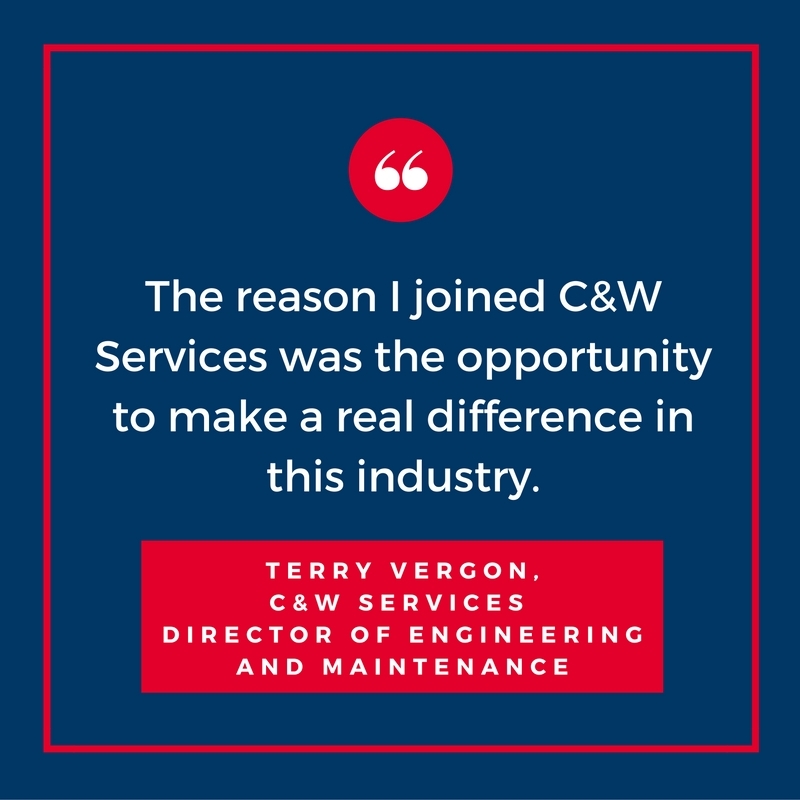 Terry Vergon joined C&W Services in November 2015 as director of engineering and maintenance. His responsibilities include product development, standards and requirements, process improvement, technology integration and reliability engineering. To get a look into Terry and his career, it’s important to hear direct from him. Herewith, his insight into his career trajectory, experiences and future projects. 1. 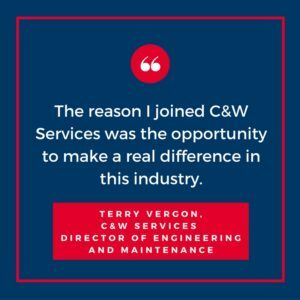 Why did you Join C&W Services? The reason I joined C&W Services was the opportunity to make a real difference in this industry with a company that is investing in the future and has a vision that is innovative enough to cause real market disruption. 2. Can you talk about yourself and your career trajectory? I’m not sure about others, but working in facilities wasn’t what I wanted to be when I was growing up. My heroes were Albert Einstein, Neil Armstrong and Mr. Spock. I wanted to be an astronaut or captain of a large ship. (When you are 8 and your aunt takes you on a tour of an aircraft carrier with the captain, it makes an impression.) That route would take me through the military. I joined the Navy and became a nuclear power plant operator and instructor. After eight years on submarines, I got out and worked in the nuclear field (commercial power plants and Department of Defense/Department of Energy sites) for another 10 years. Sometime after that, a friend of mine from the Navy offered me the opportunity to be a facilities manager at a high-tech manufacturing plant. This was my first time in facilities, and I loved it. It was the pace of keeping up with 1,500 people in a constantly changing plant; everyday was a new challenge. But good things never last forever, and the plant was shut down and the operations shipped to Asia. Soon after that, a company that needed a facilities manager for a data center called me—I actually asked the guy interviewing me what a data center was. During the next 15 years, I constructed and operated data centers. There was a company in one of my data centers that, frankly, didn’t understand data centers and how to operate within them. I wrote a letter to them informing them of the mistakes they were making, encouraging them to contact me with any questions. Eighteen interviews later, I was the global data center manager for Google. You can’t retire when you’re 40 something, so I went back to school, wrote a book and started consulting for mission critical operations. This activity provided me with many great opportunities to work with others from different industries and countries. I also took positions with global responsibilities for facilities that provided me with an education in different cultures and needs. During this period, I took a position with Cushman & Wakefield as global critical operations manager for a high-tech client. Eventually, this led me to my current position here at C&W Services as director of engineering and maintenance. 3. Can you talk about your time with C&W Services? I have just passed my one-year anniversary working for C&W Services, and I’m still in love with what I do. I continue to be excited about the vision and direction of the company, and the role I get to play in that. In the real estate business it is rare that engineering services are given anything more than lip service. The reason that I came to work for C&W Services is that the leadership understands that to provide engineering services you require a strong technical bench to support the field operations. I have worked for others that realistically had no support for the accounts, and from an account director’s perspective it’s like jumping out of an airplane without a parachute. We are building a technical services company that has the expertise to operate any mission critical or high-tech facility. We have some of the best operations and engineering staff that I have seen globally and have the honor to work with. In our future, there are plans to expand our reliability engineering services and infuse new exciting technologies into our services. Personally, the challenges of getting organizations to their maximum efficiency and effectiveness. I love the opportunity to blend technology and human innovation to create solutions that benefit our workforce and clients. 5. What interests you most about the facilities services industry? The challenges that we face every day as the industries we support constantly change with technology and operational philosophies. The question of how we can evolve to stay ahead of the dynamic needs of these environments keeps me engaged. 6. Are there any projects in the pipeline you’d like to share? There are two areas we are focusing on: reliability engineering and technical training. Many of our clients have facility operations for which failure would cause significant damage to their bottom line and get them on the front page of the Wall Street Journal. We continue to develop our reliability engineering services to prevent this. By using scientific methods and statistical analysis, we can eliminate unplanned downtime, reduce overall cost, extend equipment longevity and increase capacities. As for technical training, this is an area that we have identified as requiring additional focus. We provide safety training every day, and our impressive safety record shows the value of this. We want to provide the same level of technical training. Our world of facilities is constantly changing with technology and new equipment/systems, and it requires constant training to keep up with this pace of change. We need to become, in the truest sense of the words, a learning company. This supports our goal of providing great value to not only our clients, but our people as well. 7. Talk about the role engineering and maintenance play in the facilities services industry. I would be lying if I didn’t tell you that I believe engineering and maintenance are the reason that facilities exist (with acknowledgment to janitorial and landscaping). It’s a myopic view, but it keeps me focused. It doesn’t matter what kind of building you have, it requires maintenance and if you keep it cool or warm, it requires engineering. If your business depends on your facilities to distribute, control, monitor, produce, manufacture, transport or perform research, you need some form of reliability engineering. 8. Any other comments you have about your career or C&W Services in general? While I didn’t grow up thinking that I wanted to be in facilities, it has turned out to be a very rewarding career that can take you anywhere in the world. You may get the chance to work with organizations that are literally changing our world. Imagine working with Google, SpaceX, Genentech, Microsoft, Apple, Tesla and more. They all need facilities to operate, and working for a facilities services company like C&W Services is a great place to start.